Helical-bevel gear units from SEW-EURODRIVE provide a high degree of efficiency of over 96% in both torque directions and at all input speeds. With performance designed to last – high-endurance gearing enables high-torque, wear-free operation. With our remarkably efficient helical-bevel gearmotors, you have energy-saving angular gear drives at your fingertips. As they also have a long maintenance-free service life, they can be used in every application with AC asynchronous motors, asynchronous and synchronous servomotors. A reduced backlash version is available for precise positioning tasks. 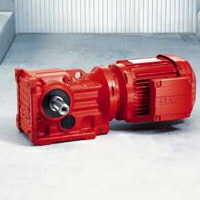 Purchase your SEW Eurodrive Helical Bevel Gear Motor K Series today!